Well, if Mother Nature took her foot off the gas the past couple of weeks with regard to the changing fall colors, she seems to also be braking a little bit! Contrary to expert predictions at the beginning of the season, we are NOT having an early fall, but rather a late one. With Week 5 upon us, let’s see where the fall color is. In Pisgah National Forest around the Inn on Mill Creek (elevation: 2,300 feet), we are at about 60% on the fall color gauge. Plenty of trees are holding out on us, including most maples, sassafras and oak trees. It appears that some areas above 4,000 feet are just now peaking — a full week behind schedule — so the Blue Ridge Parkway is still offering a good color show heading into late October, with lower elevations set to peak around Halloween. We anticipate a spectacular end to October in the Asheville area. Daytrip Destination Drive #1: North Carolina Arboretum. I mean, how adorable is the photo of the tiny maple tree above? 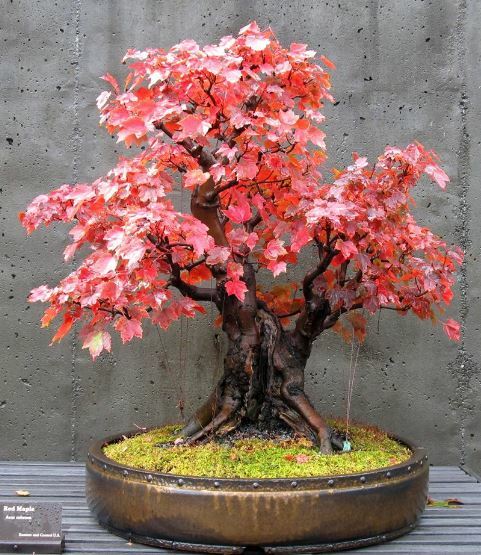 Yes, the deciduous species of trees in the North Carolina Arboretum’s beautiful bonsai collection change right alongside their life-size counterparts. With more than 430 acres, ten miles of hiking trails, exhibits, and a gorgeous mountain setting, the North Carolina Arboretum should be on everyone’s list of places to visit in Asheville during the fall season. For a scenic drive, take the Blue Ridge Parkway at Hwy 70 in east Asheville and head south to the Arboretum. And with the fall colors on a later-than-normal schedule this year, you can see even more fall splendor by taking the Parkway 25 minutes south from the Arboretum to Mount Pisgah. Alternative Destination: If you want an even more outdoorsy experience, check out the Bent Creek area adjacent to the North Carolina Arboretum. There are tons of trails, for walking, hiking and mountain biking. Daytrip Destination Drive #2: Rattlesnake Lodge. Just north of Asheville on the Blue Ridge Parkway is a fabulous trail to the site of the former Rattlesnake Lodge, home to Dr. Chase P. Ambler in the early 1900s. Dr. Ambler was not only a respected physician in the Asheville area, but a serious conservationist, and was part of the movements to create the Great Smoky Mountains National Park and Pisgah National Forest. 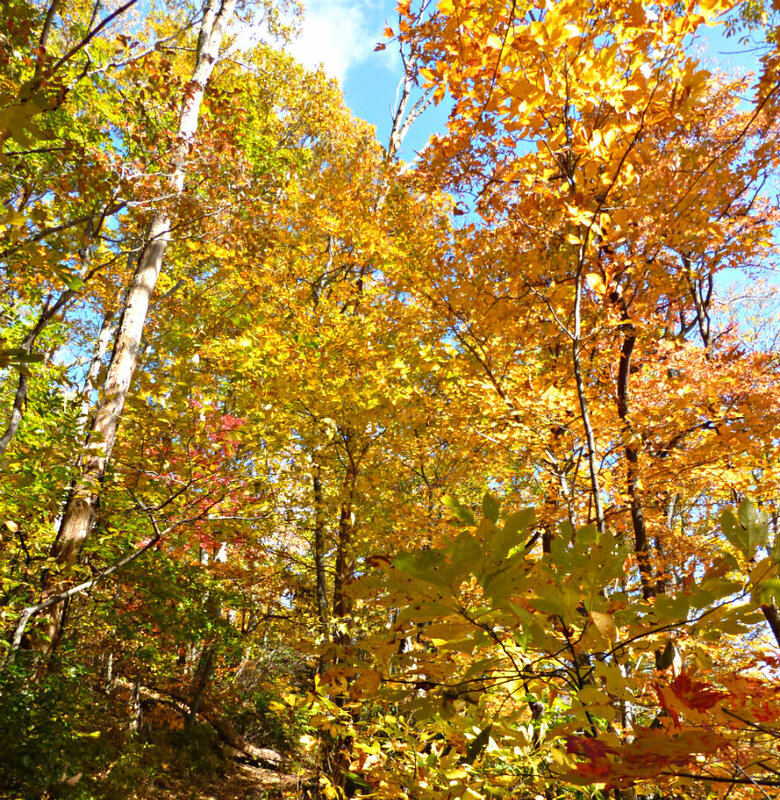 The hike is about 3 miles roundtrip and takes you right into scores of colorful fall foliage. To get there, head north on the Blue Ridge Parkway out of Asheville to Ox Creek Road. Alternative Destination: For a different exploration of nature coupled with history, you can take the Blue Ridge Parkway north from Asheville to Ox Creek Road. Then go about 10 minutes north to Reems Creek Road, to the Vance Birthplace. An influential North Carolinian, Zebulon Vance was first elected to public office at the age of 24. He later became the state’s governor during the Civil War and was a U.S. Senator afterward. His birthplace is in a stunning setting with great views of the mountains and fall foliage. This entry was posted in Fall Color Reports, Fall near Asheville, Hiking and Waterfall Trails and tagged Asheville, Black Mountain, Blue Ridge Parkway, fall foliage, hiking, Pisgah National Forest, scenic drives by Inn on Mill Creek. Bookmark the permalink.